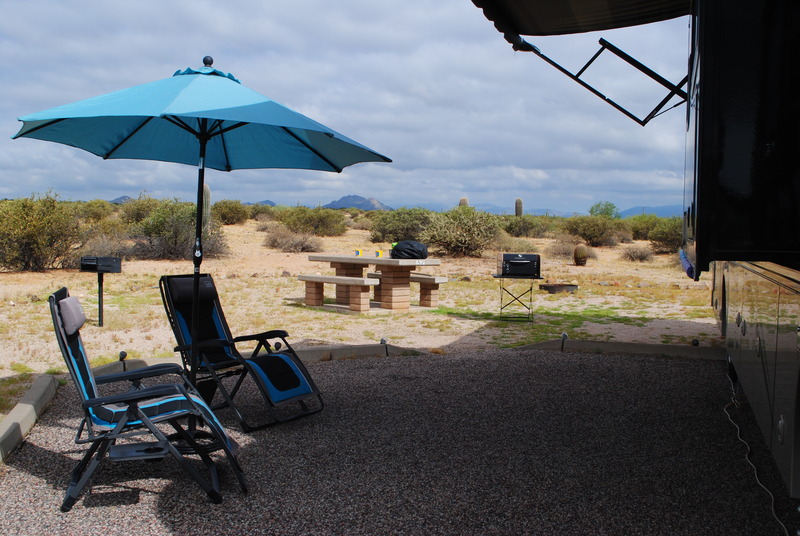 Bill already has his Traeger grill set up and ready to go, and I have my outdoor oven set up on the picnic table just waiting for me to cook up something wonderful for friends/family when they come to visit… You all know how I love to entertain…! We even set up our chairs and umbrella so we can sit outside and watch our outdoor TV in the evenings if the mood strikes us.. Ha! We have stunning views of the surrounding mountains. The mountain in the picture below is where the sun sets and casts its golden glow every evening… so beautiful. 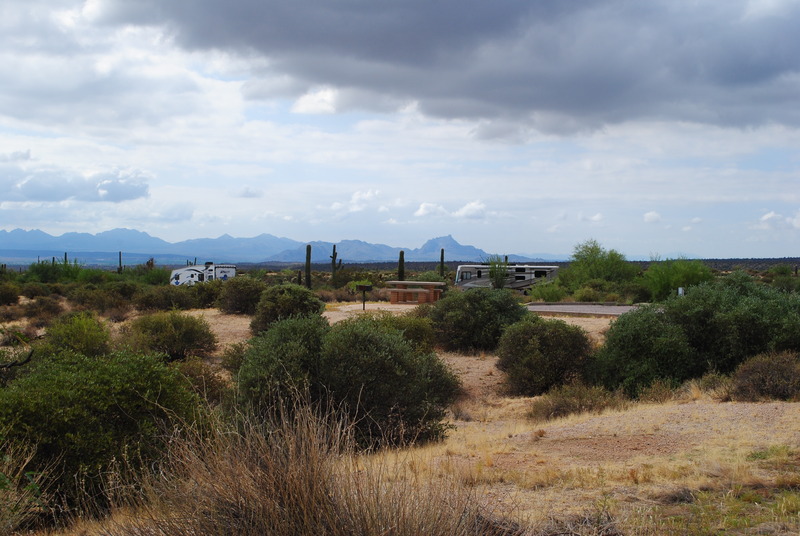 Being a desert rat through and through since 1952…, I just can’t get enough of the beautiful Arizona deserts! 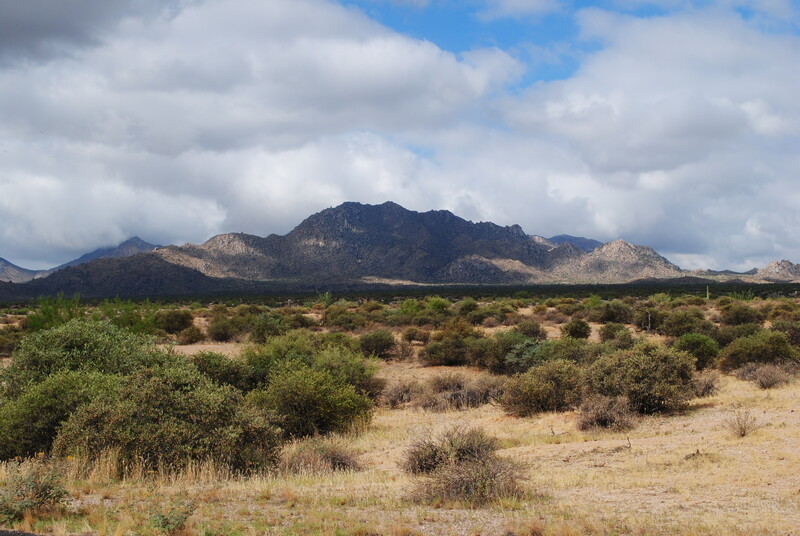 Like San Tan, where we were last winter, McDowell Mountain Park offers miles and miles of beautiful hiking trails, as well as mountain biking, and horseback ridding. 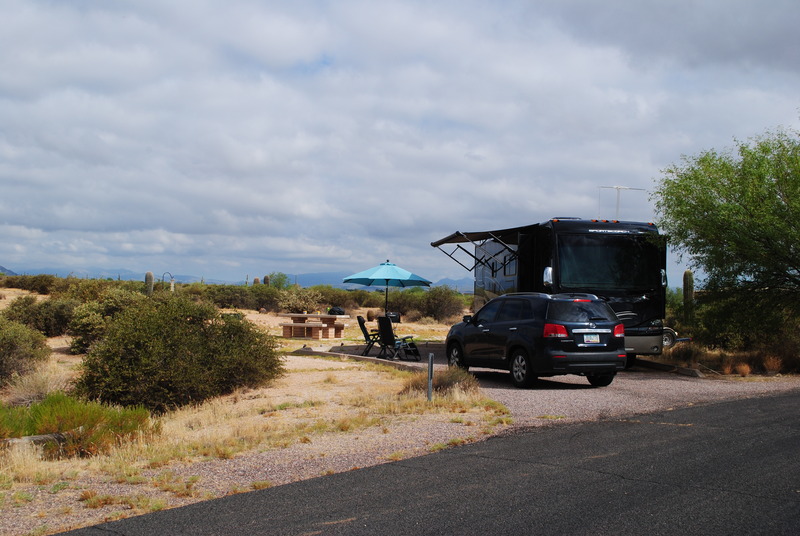 But McDowell Mountain Park also offers overnight camping as well. 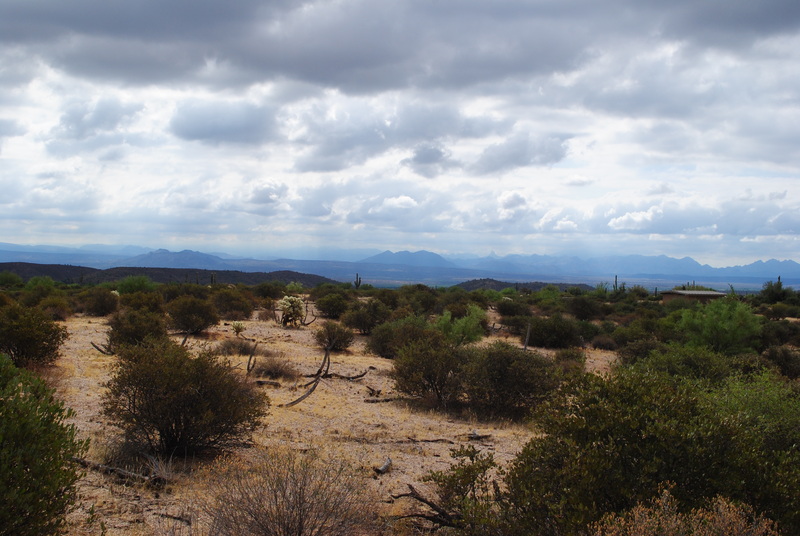 McDowell Mountain Regional Park is located just outside of Fountain Hills Arizona. Fountain Hills is well-known for having one of the highest fountains in the world! The fountain sits in the center of a man-made lake in the center of the Fountain Hills community. We can actually see the fountain from the front window of our motorhome. 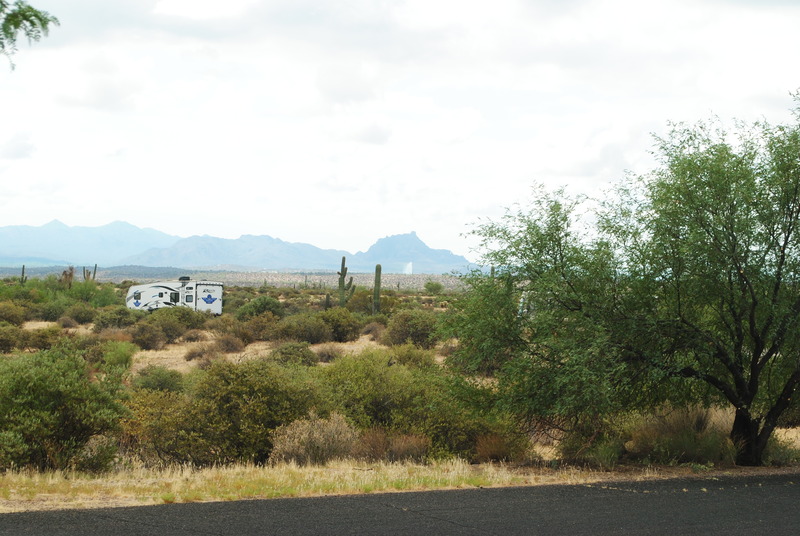 Look closely in the middle of the picture below and you will see a white mark against the mountain in the background just to the right of the saguaro cactus. That is the fountain shooting high in the air. The fountain sends a snow-white jet stream of water 560 feet into the blue desert sky. It is set to go off at the top of every hour for fifteen minutes between the hours of 10:00 A.M and 9:00 P.M. The fountain is the center piece and landmark of Fountain Hills, a community of rolling hills and spectacular mountain views. Fountain Hills is located just east of Scottsdale, Arizona. At night the fountain becomes a jet stream of gold and white against the desert sky. Golden spotlights situated in the base of the jet spray send glowing illumination up the first 300 feet of the column of water where it blends with a contrasting silver-white light on the upper portion. On St. Patrick’s Day the fountain is turned green. How fun is that! FABULOUS!!!!!!! Can’t wait to see the new neighborhood! Love you!! MORE!